Religious singer Opick believes the current mushrooming of religious music, especially as the fasting month of Ramadhan approaches, is motivated by business and has nothing to do with promoting religiousness. Opick, who was once a little-knows rocker said, to strive for improvements, we should work together. Opick said real Islamic music not only needed lyrics and melidies, but something deeper to encourage spirituality in its listeners daily lives. We can start with small things. I’m also still learning, Opick – whose real name is Ainur Rofiq Lil Firdaus – was quoted as saying. 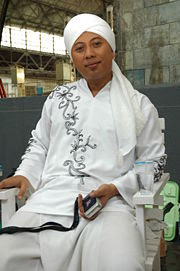 In the weeks leading up to Ramadhan, singers and boy bands in the country often release their so-called religious albums, which include video clips of them wearing Muslim attire.